Me: "Why do you think the price is so low? Something has to be wrong with it. Maybe the roof needs repair?" Chris: "It didn't have a ton of pictures on the site. Who knows? Maybe something happened this winter. BUT, did you see it has a pool?" Me: "Yes. Which makes me wonder MORE why it's such a great price for such a nice house?" Mags: "Maybe the pool has sharks?" We'll keep an eye out…just in case. Mags: "They look like gumballs for a giant…or a T. Rex!" Me: "Do you think a T. Rex would have chewed gum?" Mags: "Yes. Can you imagine his breath after he ate a Stegosaurus? GROSS!" Mags: "Holy moly, I just 'woked' up and I'm already super duper tired again." I've been feeling a little bit guilty. Yes, I know, big surprise there. You can take the girl out of the Catholic, but you can't take the Catholic out of the girl…or something like that. But, I really have been feeling this way since mid-August when I began my new job. I hit the ground running in that high school and it's been a steady uphill climb ever since. Raise your hand if you can relate. Raise your hand if you can't fathom that it's already FEBRUARY! To be fair, January was a series of snow days sprinkled with some delays and topped with a few consecutive days of school. This year has been a wild ride and it's not about to brake anytime soon. Due to how the time disapparated before my very eyes, I've allowed some things to slide. Writing consistently has been one of them. And I've missed it. Terribly. I've struggled with different ways to balance my schedule better. I've wrangled with how to fit everything into my day. I've mourned for the former days that included a Mags and Tuck filled day. I've pulled myself up by the bootstraps and given myself a good, stern talking to. And then, just as I started to sink down into the doldrums again, I was struck with some wisdom (from my OWN head). QUICK! Let me share it before this thought's shelf-life expires. My life could be compared to making dinner. I have quite a few pots boiling, like any other person out there. 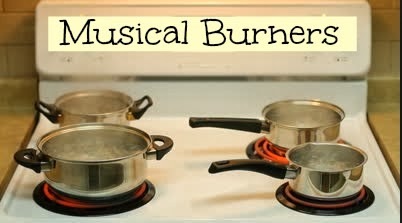 I've always used all the burners on the stove, but have constantly switched my pots around based on their needs. I've had to decide when to turn up the heat and when to allow something to simmer for a bit. But, just like how I learned which pots need my immediate attention when cooking, I've had to give myself a break. Was I fantastic at balancing all the pots on the stove? HECK NO! In fact, each one of them boiled over quite a few times. And just like anything else in life, I turned down the heat, cleaned up the mess and tried a new configuration. My sanity depended on it. So, for now, while work and family are the most needy and delicate dishes I have right in front of me, other things will be stirred intermittently. I just need to set three timers, write myself seven sticky notes and tie ten strings on each of my fingers…but I promise I won't forget. These three words really speak to me as mom, a wife and a woman. Taking care of myself is often overlooked as I run through the day at a break-neck pace. One more thing on my to do list often puts me over my very thin sane edge. But what if there was an incentive to motivate you to measure your activity AND you had help to manage all the data? Well, you can! At Zamzee. Zamzee is a meter that measures activity and makes moving fun. The Zamzee website provides different challenges where you can "BRING IT." Each challenge is set by time, pointz and zams. Zams are the currency that allow you to earn prizes from their site for being active. It's as easy as that. There are a variety of different challenges that you can choose from to cater to your pace and level of activity for the day. 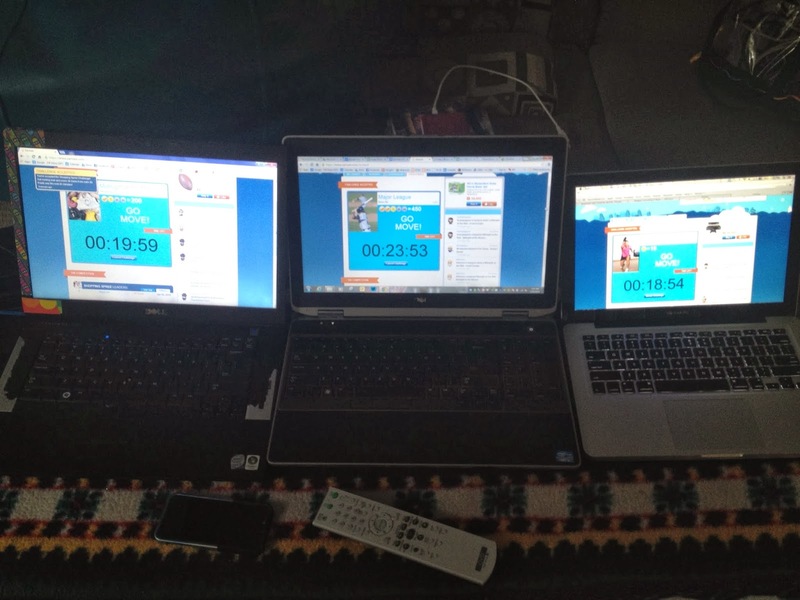 Zamzee allows our family to work as a team or give each other a little healthy competition. In order to earn something we all want from the site, we motivate each other to keep on moving. Currently our family is having a blast playing the game, Skylanders. Guess what? You can earn Skylander characters with zams at Zamzee! We're all pushing hard so we can each earn one. How cool, right? Check out how our family does it! BUT WAIT! ONE MORE THING BEFORE YOU GO! below for a chance to win. Deadline is February 7th, 2014. "After all, if you lead with fun, health will follow." I am a mom of 2 and a wife of 1 who just went back to teaching full-time. I'm also a writer and podcast producer. I aspire to be a professional napper because I am TIRED. I plan to investigate the thoughts of my six and eight-year-old in a fun and light way. If you are up for the adventure, I hope you'll join me! Feel free to email me at worldaccordingtomags@gmail.com.